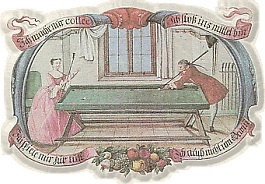 THE ONLY WEBSITE DEDICATED TO THE HISTORY OF SNOOKER AND ENGLISH BILLIARDS. This site has been put together using original content written by Roger Lee & Stuart Bennett, plus additional content written by Neil Bell. Roger has been a collector of billiards and snooker memorabilia for more than 30 years, and from 1996 to 2005 has organised the Heritage Room, at The Crucible Theatre, Sheffield, for the duration of the Embassy World Professional Snooker Championship, on behalf of the World Snooker Association. Stuart is a professional Billiards and Snooker referee who has been seen many times on television officiating at World Snooker events including 4 appearances at the Crucible Theatre, Sheffield at the Embassy World Snooker Championships and also the final of the 2002 Powerhouse UK championship in York. As this site grows, we hope to supply everything you could wish to know about these two connected games; the origins, the ups and downs in development, the great events and the characters which have delighted followers of both games for many decades. Our archives chart the history of the games of snooker and billiards, from the early days all the way through to the global spectacle that is modern day snooker. Who would have thought in 1900 that a century on, snooker would be televised all over the world. That it would be sponsored by big name bookmakers like Betfred, that it would attract huge betting interest and turnover, and that competitor would earn hundreds of thousands of pounds in prize money? Whilst we completely embrace the modern game, we also want to remember where the sport came from, and the people who made this progression possible. That is the point of this site. There is a for sale section where you will be able to purchase antique books on billiards and snooker by such authors as Riso Levi, Major Broadfoot, Walter Lindrum, Joe Davis and Tom Newman but to name a few. There is also an opportunity to buy archive movie reel footage of the great players on video or DVD including Joe Davis, Tom Newman, Walter Lindrum, Willie Smith, Fred Davis, Clark McConachy, Melbourne Inman, Horace Lindrum and many more. We also have in our archive many great matches on both snooker, English & continental billiards from television broadcasts (1970's - 2000) Lists are available just e-mail for details. If you are a collector of billiards and snooker memorabilia or just would like to more about the history of both billiards and snooker this is the site for you. We will be adding to our player profiles of such greats as John Roberts Jun. W.J.Peall, George Gray and probably the greatest exponent of English billiards, Walter Lindrum. And don’t forget, we want to hear your views. So if you have any views on how we can make this website better, or any comments, good or bad, please get in touch. Just two points to remember, although we may be able to offer items connected with American or Continental cue sports, this site is primarily for English Billiards and Snooker, and secondly we do not offer a modern day statistics/results service.